Film on film balers balers: fantastic plastic.... or is it? Wrapping bales? There are now growing number of balers which can apply film inside the chamber, designed to offer extra protection and quality. Jane Carley looks at the pros and cons. Net wrap has almost replaced twine tying of round bales in many parts of the country, offering a tighter package which wraps and stores well. However, a number of manufacturers are looking to take this a stage further by applying a layer of film to the bale before it leaves the chamber rather than net. Benefits claimed include better silage quality due to the increased oxygen barrier around the cylindrical side of the bale. 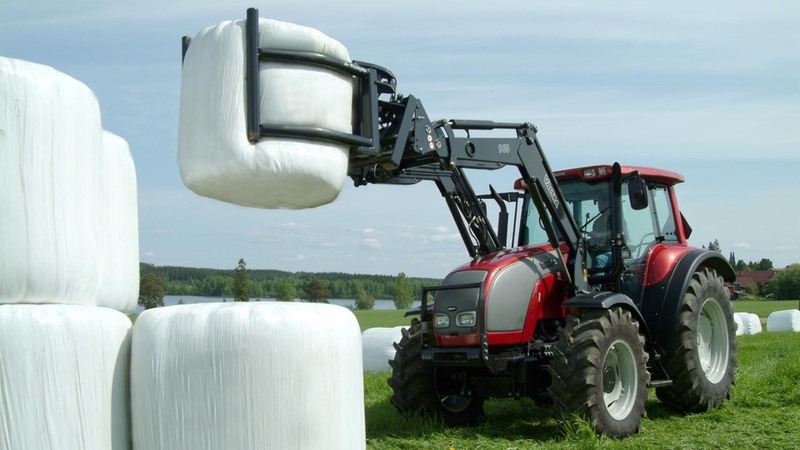 Tighter wrapping of the bales using pre-stretched film also reduces bale expansion, resulting in maximum preservation and gives a better shaped bale for easier storage, say the manufacturers. There is also the potential to reduce the number of layers of plastic applied at the final wrapping stage, since the film put on in the chamber offers more protection than net. When unwrapping, the film is said to catch on the bale less, even after a long period of storage or in frosty conditions.Waste management is also easer with just one type of plastic for disposal, rather than plastic plus net. No matter how bales are wrapped, bales still have to be handled in a careful and timely manner, says Rhun Fychan, silage specialist at IBERS. 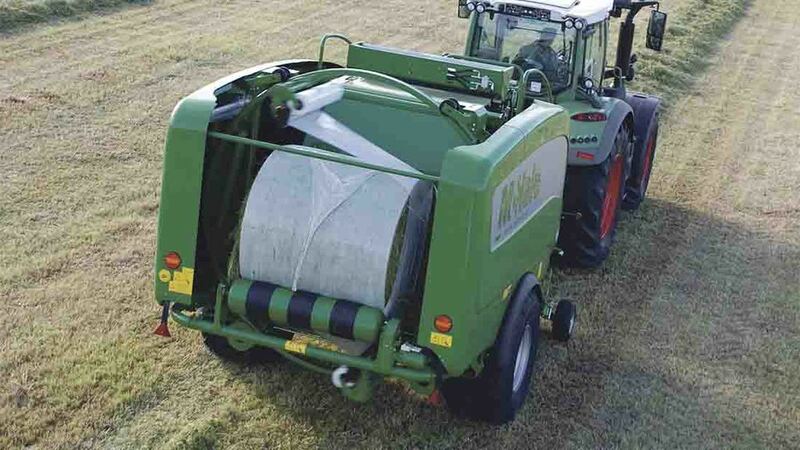 Rhun Fychan, silage specialist at IBERS, comments that any development which aims to improve bale quality is welcome but cautions that reducing wraps to four layers could potentially produce a weak point on the bale shoulders, depending on the grass type. Another issue, he points out, is that even though film application in the chamber is an excellent development, the film is tensioned in a different direction to that produced by the final wrapper, which means the bond between the two films is not as strong. Kuhn Farm Machinery has introduced a new version of its round baler-wrapper combination machine, the i-BIO+, featuring a patented twin film-on-film wrapping system. The i-BIO+ is an integrated baler and wrapper with the six rollers in the bottom of the chamber acting as a wrapping table during the bale wrapping process. Its film binding system uses two film reels to bind the cylindrical side of the bale using standard sized rolls (1,500m long, 750mm wide by 25um thick), eliminating the need to order separate binding and wrapping film. Kuhn claims its system offers quick and easy roll loading by hydraulically folding the film reels into their loading/unloading position. A higher stretch ratio is said to offer up to 30 per cent film cost savings for film binding as well as longer intervals between the exchange of film rolls, cutting downtime. Switching between film and net binding is said to be quick and simple as the two systems are separate. Bale wrapping is taken care of by the manufacturer’s IntelliWrap system which gives complete control of the wrapping process, allowing the operator to select the number of film layers and to adjust film overlap. The i-BIO+’s wrapping ring allows film to be applied at up to 50 revolutions per minute. 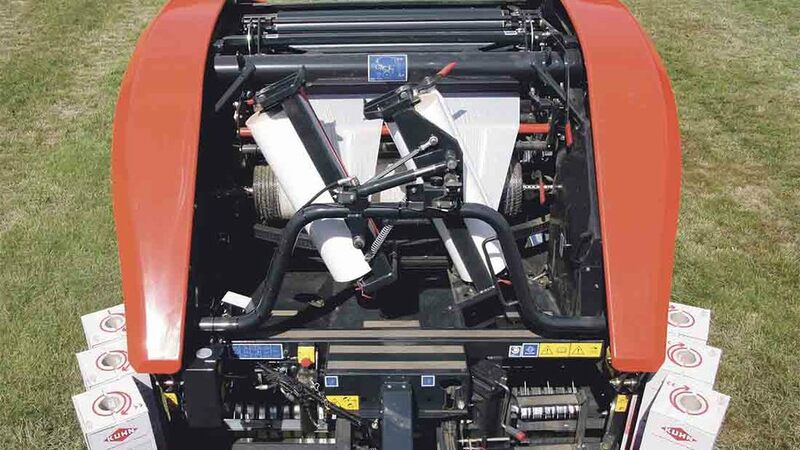 The baler is also IsoBus compatible, with all functions managed via a colour display terminal. Both the New Holland Roll Baler 125 Combi and Roll Baler 135 Ultra can be specified with a film-wrap system. 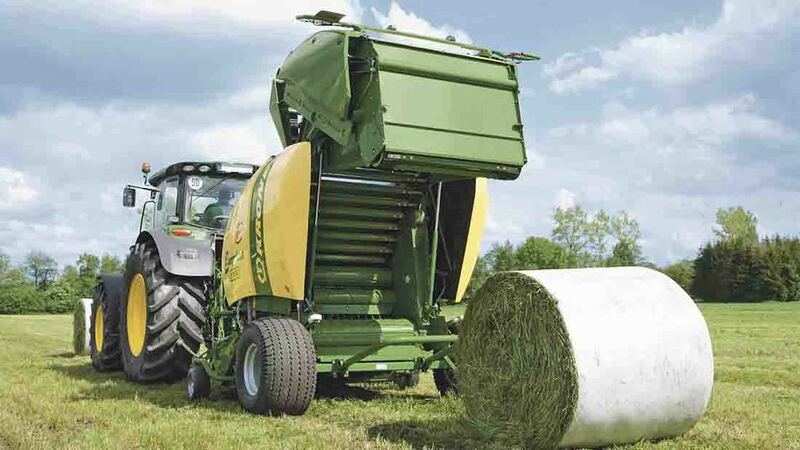 Designed to work in conjunction with the integral wrapping system, a hydraulic motor drives the film roll to feed the film onto the bale, compressing the film into a thin strip initially to feed it into the bale chamber. The film arm mechanism pre-stretches the film wrap before it is rolled around the bale for consistent wrapping quality, says the manufacturer. Net wrap can also be accommodated by the same mechanism, giving a quick switch between crops. 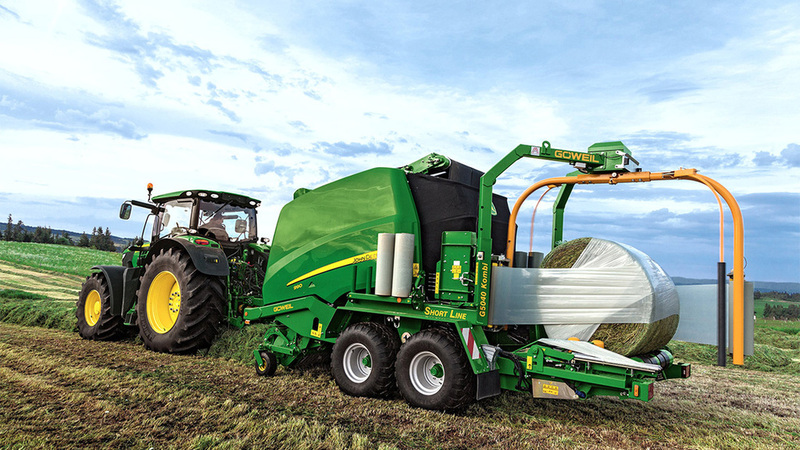 Krone’s Comprima Xtreme balers and combi wrappers can now be fitted with a film on film system and the 1.28m wide, 2,000m long and 16um thick Krone RoundWrap stretch film covers the bale from edge to edge, says the firm. The manufacturer points out that its film system differs from others on the market as the film is not gathered before it is cut, allowing the next wrapping cycle to start immediately with the film already spread to its full width, saving time and material costs. After the wrapping cycle is completed, the film is cut across the full bale width and is ready to be applied across the full width of the next bale. The film roll is simply replaced with net roll to switch to netwrapping. 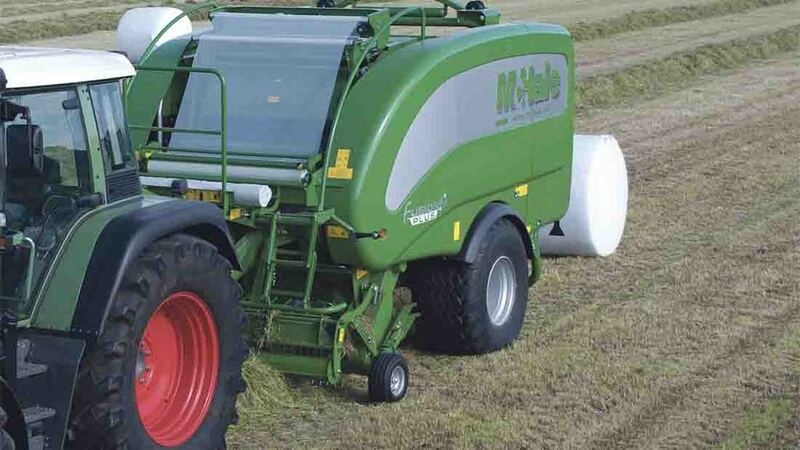 The McHale Fusion 3 Plus integrated wrapper baler uses a patented application system for the chamber film which adjusts the breaking force on the roll of plastic to suit working conditions and allow for a continuously variable stretch. This allows it to automatically adapt to changes in temperature during the day without the operator having to adjust any settings. When plastic is applied to the barrel of the bale it can be stretched to approximately 20 per cent, which McHale points out is higher than can be achieved with netwrap or twine, giving a tighter, better shaped bale. The company adds that as the plastic is being stretched as it is being applied to the barrel of the bale it expels more air than net wrap would, resulting in better silage quality. Netwrap can also be used on this baler via a simple adjustment. 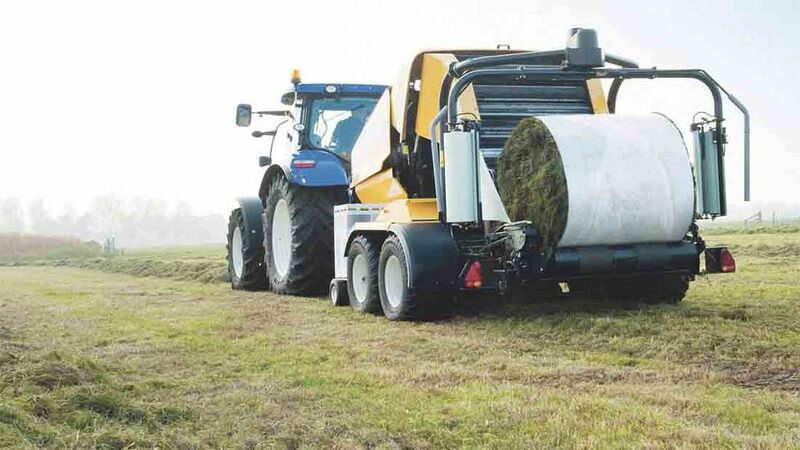 Vicon thinks film on film technology could potentially be a good idea for its non-stop Fast Bale round baler. Other leading baler manufacturers are more guarded about the benefits of film on film systems. Vicon has been developing a film wrap system for its FastBale integrated baler-wrapper for two years, and technical manager Tim Baker says that it is likely to be commercially available in 2017. John Deere has taken bale protection in a different direction, introducing B-Wrap for storing unwrapped dry hay and straw bales outside. Designed to reduce dry matter losses compared to netwrap, two layers of composite material protect the bale from bad weather and ground moisture offering improved bale quality and storage flexibility fully compensate for the slightly higher material cost per bale. John Deere reckons for the extra cost of the film on film wrapping technology, it is not worth it at the moment. He points out; “There are obvious cost implications in using film in place of net wrap, i.e. around £1.00 - £1.50 per bale more expensive than net. The baler is also more expensive as it involves a much more complex net/film tying system. “The original thought was that it would allow fewer film layers to be applied during the wrapping process that would outweigh the extra cost of film instead of net; in reality this does not offer the corners and the outside 400mm on the side of the bales sufficient coverage. Mr Baker comments on the claim that film on film makes a tighter bale as the film does not stretch like net wrap and therefore the bales hold their shape much better for longer.